A real estate company is responsible for handling any dealings related to the selling or purchase or even leasing of properties. Here’s a true fact about the real estate industry- this particular field is largely dependent on the publicity that the company receives. The reason is fairly obvious- unless your clients feel that they can trust you, they aren’t going into business with you. Naturally, it is important to go all out when it comes to flyers, posters or even ad banners for your business and that is exactly why these templates can come in handy. 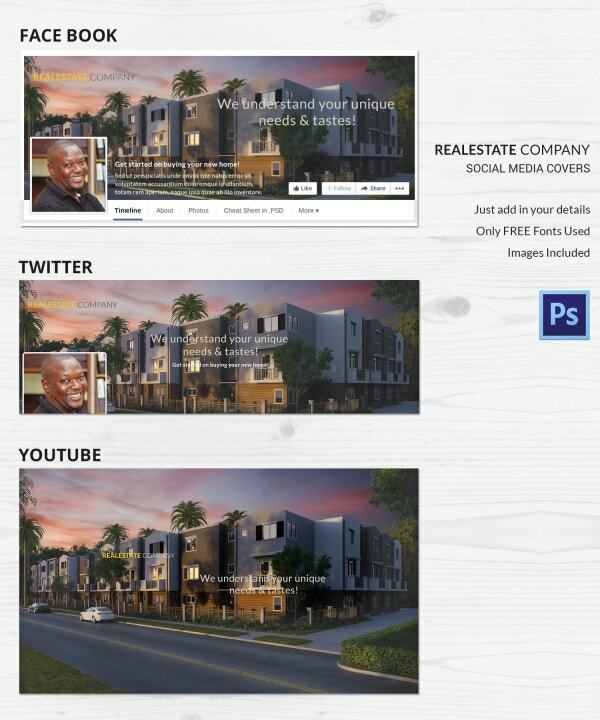 You can also see Real Estate WordPress Themes. You must have come across an ad banner when you’re browsing online. 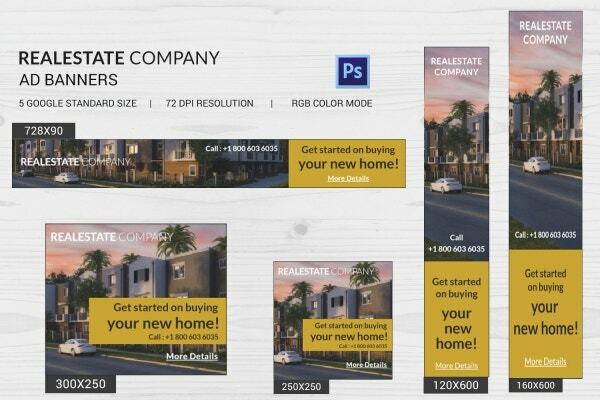 If you’re a real estate agent, you can use these ad templates to create banners for your business. You will be getting 5 Google standard size templates having a 72 DPI resolution. They also come in a RGB colour mode. 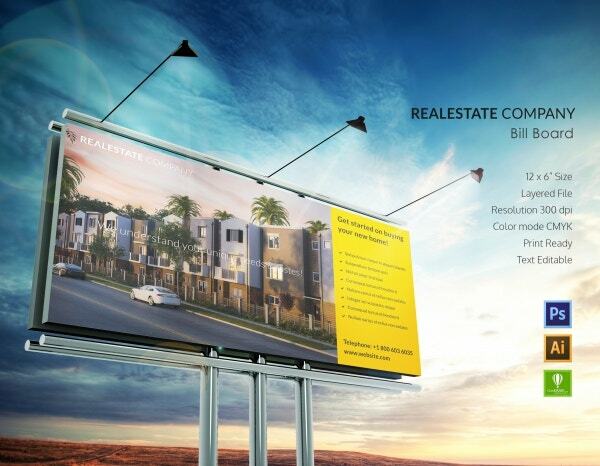 Billboards are commonly used means of advertisement when it comes to real estate companies. This template here has been developed specially for billboards. It comes in a 12 x 6″ size and is fully customizable. It would be fairly easy to edit and customize the template. The template contains a layered file as well and has a resolution of 300 DPI. Being a real estate agent, you should be leaving a lasting impression on your clients. 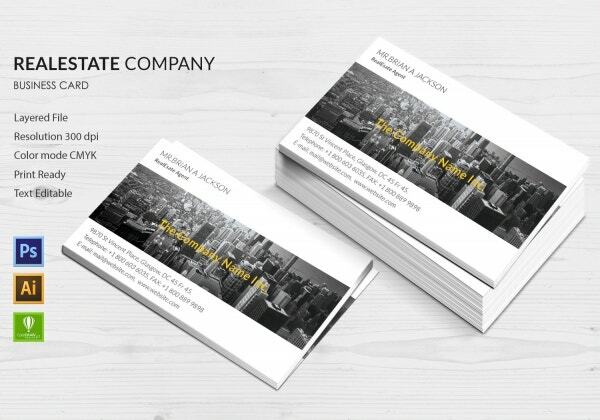 One way of doing that would be to use these business cards. The card has been kept simple yet sleek and that makes it appear really stylish. The templates are ready for print and are fully customizable. Also, you would be getting them in a resolution of 300 DPI. 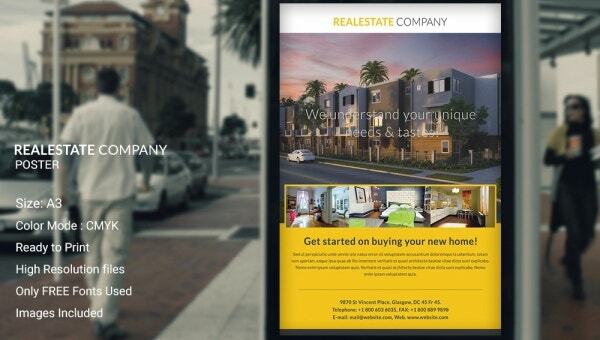 Ebooks are all the fad right now and as a real estate company, you need to make your presence felt there. You can then use this template which comes in a handy A4 size format. Also, the text provided on the template is fully editable and customizable. The colour mode used here is CMYK and it has a resolution of 300 DPI. 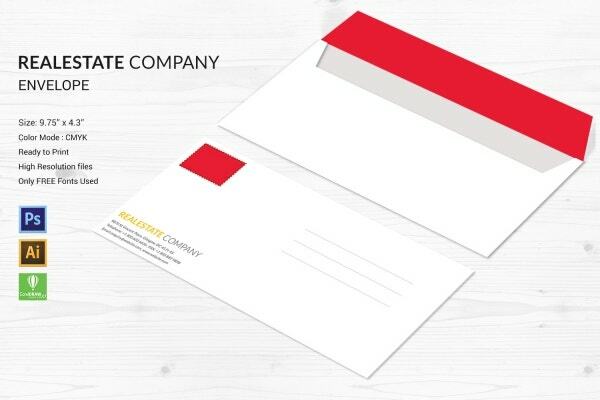 Creating an envelope can become really easy if you use this template. 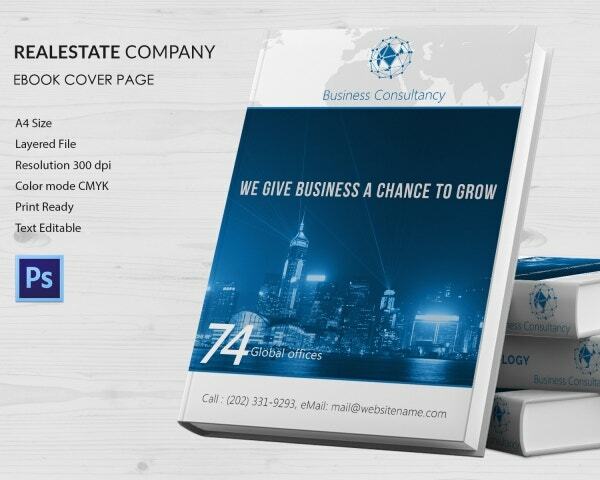 This template has been specifically designed to suit the needs of a real estate company. It comes in a standard 9.75 x 4.3″ size and is absolutely ready to print. Also, it uses a colour mode of CMYK. Plus, you will be getting the high resolution file here along with free fonts. A flyer is a lot like a brochure, only it is not as detailed. 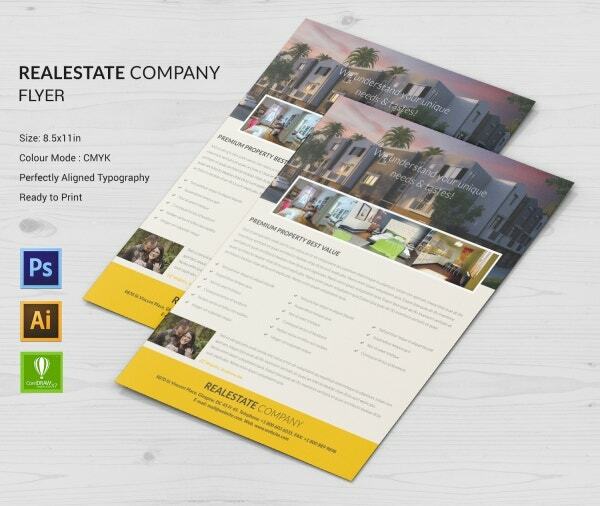 This template here comes with an attractive image and a catchy headline, which are essential components of a flyer. This flyer comes in a size of 8.5 x 11 inches. The colour mode used here is CMYK. Also, this template boasts of a perfectly aligned typography and is ready to be printed. 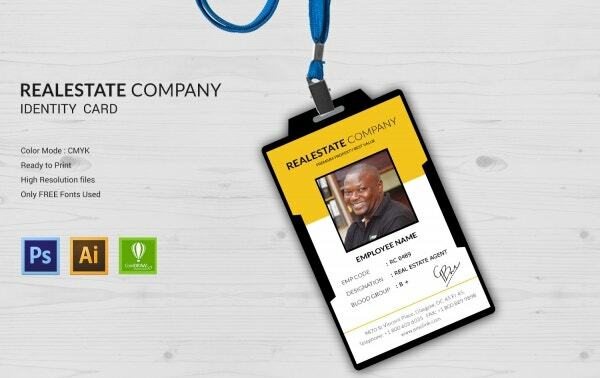 It is a well known fact that all companies, even real estate ones, require specialized identity cards for their employees. An easy way of creating that would be to use this template. The template has been made ready for printing and uses only the free fonts. It also comes in high resolution which offers a pristine quality of images. 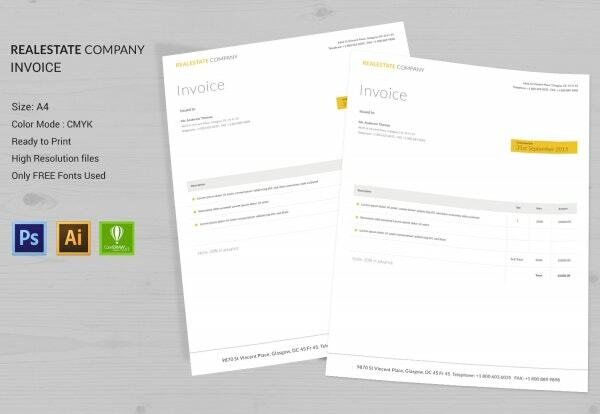 An invoice is a lot like a receipt, only it is much more detailed. This real estate company invoice has been developed keeping in minds the myriad needs of such a company. The template comes in an A4 size which makes it easy to print. Also, only free fonts have been used to create the text on the template. 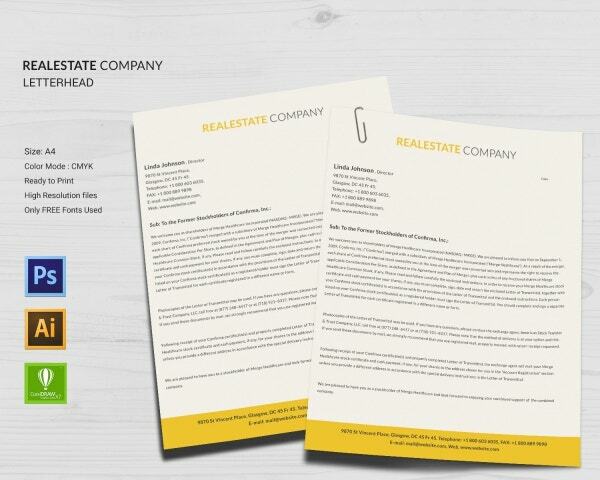 You must remember that the mark of any company resides in its letterhead and how distinctive it is. This template has been kept as simple and to the point as possible. 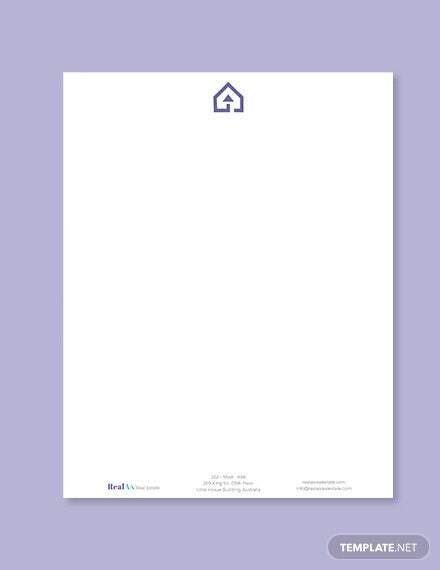 The letterhead provided here has been kept suitable for an A4 size sheet and is ready for print. Also, it uses a CMYK colour mode and a high resolution which you’re sure to appreciate. 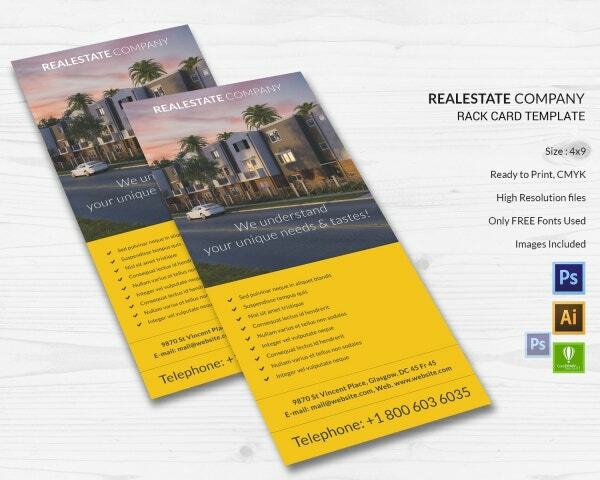 Postcards are often used by real estate companies to advertise their services and deals. To create a postcard, this template may be used. It comes in a 4.25 x 6.25″ standard size and a layered file. It also uses a colour mode of CMYK and a high resolution for all images, thus offering a clarity. Also, this template is ready for print and easy to edit. 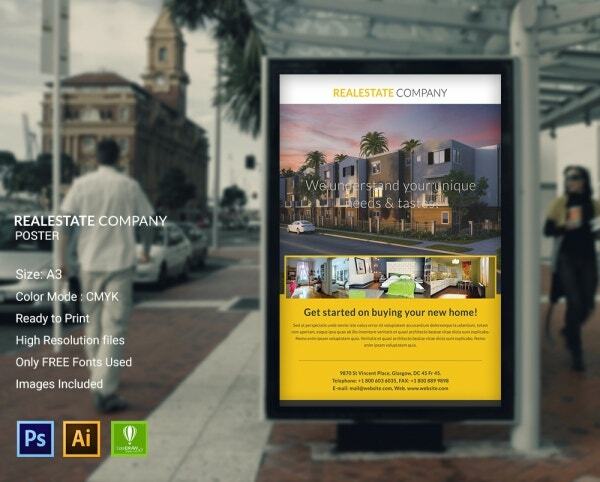 This real estate company poster has a bright exterior with a catchy headline, which is just what a poster should be. It comes in an A3 size and has a colour mode of CMYK. Also, the images provided on the poster can be edited. They have been provided here as just a sample. The template, which uses a high resolution, has been kept ready for print. 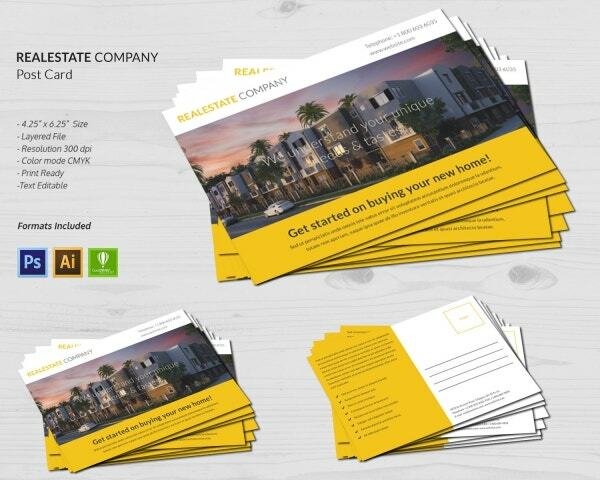 A rack card is a commonly used tool in real estate and resembles a brochure on many ways. The best part about this template is that you get these stunning images to use for your rack cards. Also, it comes in a standard 4 x 9″ size and has a colour mode of CMYK. The images are in high resolution as well. It is important for real estate companies to make their presence felt on social media platforms as well. In this template, you will be getting three cover images for three different social media platforms- Facebook, YouTube and Twitter. It uses only free fonts and you will be able to add in your details in the space provided. 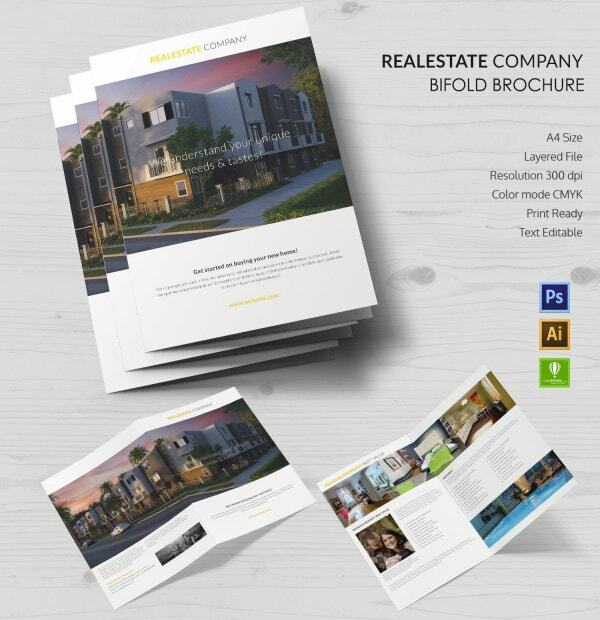 A trifold brochure is informative since it contains more information. This template here consists of the perfect balance between text and images. It comes in a portable A3 size and a layered file. It also uses a resolution of 300 DPI. Also, this template for a trifold brochure has been made ready for printing. 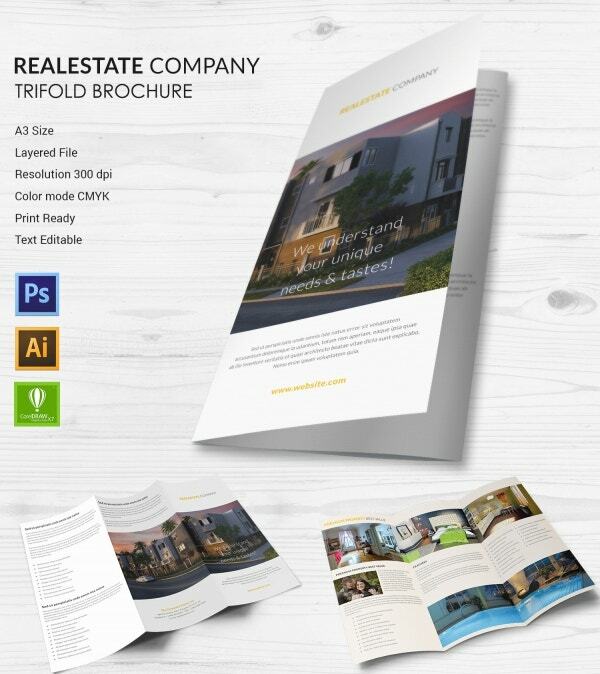 A bifold brochure would be containing two sides of text and images, held together by a perfect balance. The best part about this template is that it comes in an A4 format which makes it really easy to edit and print. The text on the template is completely editable and has been made ready for print. The template uses a resolution of 300 DPI and a colour mode of CMYK.